At The Mower Shop, we’re big fans of robotic mowers. Regardless of your garden, they make the ideal companion taking all of the work out of regular lawn maintenance. Despite having been around for a number of years now, they still remain an unknown to many and are often overlooked when considering a new mower. We feel it’s time for this to change. We’ve compiled answers to some of the most commonly asked questions. Although the answers should give you a good overview, operation, specification and features vary between the mowers on offer. For specific advice and information please get in touch with the team at The Mower Shop. Either pop into our West Haddon store, or give us a call on 01788 510 453 for friendly help and advice. 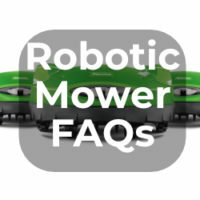 What is a robotic mower? A robotic mower is an automated lawn mower that’s designed to take the stress and hard work out of keeping your lawn pristine. Robotic mowers are designed to run automatically, regularly cutting your lawn to ensure it’s in pristine condition without your input. How do robotic mowers work? There are different types of robotic mower and their operation varies, but typically your robotic mower will be set on a schedule to run at certain times of the day. What sized lawn can a robotic mower cover? Our current robotic mower offering includes mowers suitable for anything up to 4000m². What sort of maintenance do robotic mowers require? Other than occasionally clearing the underside of the mower, robotic mowers are relatively maintenance free. The only thing you will need to do is ensure that your mower is appropriately stored over winter. We recommend servicing and software updates on an annual basis. What happens to grass clippings? Grass clippings are not collected but mulched down to ultra-fine clippings. These are then spread over the lawn to act as a natural fertiliser. Leaving no visible grass on the lawn surface. How does your robotic mower handle bad weather? When the sensor detects rain, it’ll stop mowing and return home. Only heading out again once it’s dry. Or if the temperature is below 8 degrees it will not come out to mow. No, they typically cost just a couple of pounds a month to keep charged up. This varies between models and sizes of lawns but on average they cost around £3 to £5 per month. How can I measure my lawn? There are various tools available to measure areas such as Google maps. Alternatively, if you have a square/rectangular garden you can measure the length and the width and times them together. We also as part of our installation service would measure the area and perimeter to ensure we select the correct machine for your lawn. Is it safe for children/pets? Most robotic mowers carry safety features that reduce the likelihood of any accidents. Viking iMows, for example, are fitted with a sensor that can tell when the mower is lifted or tipped and stop the blades. That being said, you should still supervise any children or pets when your robotic mower is active. What happens if it runs out of battery? When the battery is running low the machine automatically returns to its base to recharge and then return to mowing once charged. Failing this if the mower runs out of charge while active it can simply be picked up and placed on its base to recharge. Does my garden need to be flat? No. Most robotic mowers are able to operate perfectly well on slopes. You will need to check your specific model but they can typically work at anything between 35-40%. Also as part of our installation service, we would make a recommendation if we felt any areas need additional extras to help the mower cope with slopes such as heavy or tractive wheels. Does my garden need to be clear of obstacles? No, any obstacles that are movable such as bikes that are large will be detected by the mowers sensors. However, the garden should be free of small items to keep the mower and yourself safe. Solid obstacles like planters and borders in the middle of the lawn can be avoided by wiring around them with the perimeter wire so the mower will avoid them. Most robotic mowers are surprisingly quiet, making them suitable for use at any time of day or night. Most robotic mowers are fitted with security features to deter theft. Some are fitted with alarms that will sound when your robotic mower is lifted. Others are fitted with PINs & trackers to provide security. The life of your machine will vary depending on the amount of use it gets. The oldest machine we know of is 15 years old. Do robotic mowers need servicing? We would recommend that we service a machine once every 12 months to keep it up to date on software and functioning well. How long can the grass be? At the time of installation, we would recommend that the grass is mown to the normal height you would mow your lawn to. From that point on the machine will maintain the lawn and usually the height of cut is adjustable to allow for varying conditions. How long does each charge run for? This will vary depending on your robotic mower. You can, however, typically expect a charge to last anywhere from 30 minutes to 1 and a half hours depending on your model. If the battery runs low the machine will automatically return to its base to charge. Again recharge time will vary depending on the robotic mower you choose. You can expect a charge to take anywhere from 1-2 hours depending on your machine. Is mowing random or does it mow in lines? Mowing is completely random and does not leave stripes at the moment. They mow in a completely random manner leaving a high-quality finish. How does it know where your grass stops? Before running your robotic mower you'll need to install a perimeter wire to the edge of your lawn. This will tell your robotic mower where to stop and ensure it stays on your lawn. Some machines are able to be self-installed but others will require an installation service which we offer ourselves.